« Why left heart border become straight in Mitral stenosis ? Kissing balloon kisses what ? Kissing balloon is the standard technique used to tackle branch vessel stenosis . When a vessel branches out and both branches has a lesion, single balloon can not dilate a lesion optimally . This is because , the side branch not only shares a common ostial tissue but also shares plaque material within the walls of main and side vessel . Dilating one vessel alone could result in unpredictable plaque shift. Carina is the most important anatomic structure in a bifurcation zone . It acts like a grade separator. Diverting and deflecting blood flow .The length and angle of this grade separator determine the ostial shape as well . A right angled side branch will have a circular ostium .An acute-angled branch will have oval orifice . The plaque burden and distributions at this point becomes vital for many reasons. When we do PCI this carinal area should be optimally pressed and plastied and of course covered well with the metal struts.The simultaneous kissing with two balloons , one in main vessel another in side branch will reduce many of the issues . This area is a weak link for interventional cardiologists. It needs lots of efforts to protect the side vessel. When do we do kissing balloon ? Post dilatation is more often done . Look closely the layers of contention in the carinal zone. Lesion not depicted . Kissing interface : When the balloons kiss what lies in between ? When do balloons refuse to Kiss ? When there is a hard interface between the vessels like a severely calcified intima /Adventia . It need to be emphasized balloons come into contact easily in acute-angled lesions. In right angled lesions the balloons come to contact only in the proximal part. Definite indications for kissing ? Kissing is not without complications . 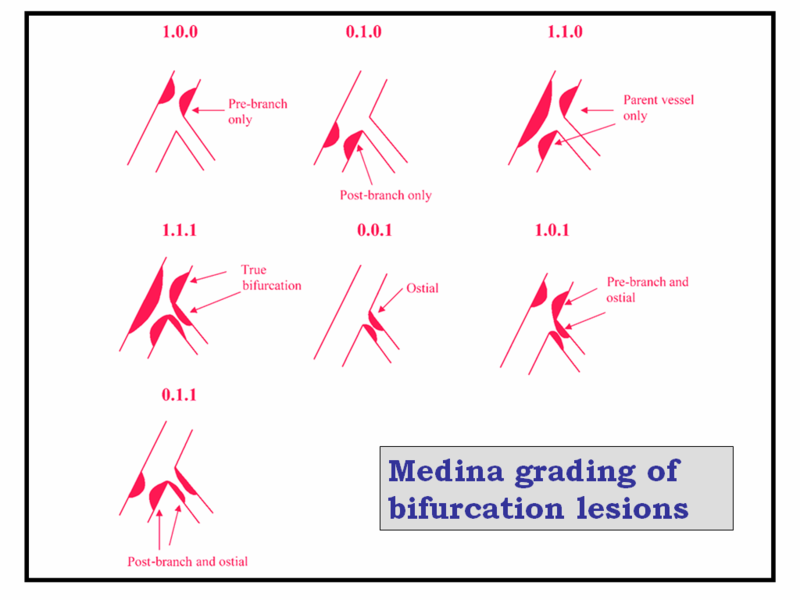 While two guide wires are placed in all bifurcation lesions , kissing is not necessary in many lesions .Of course it is a must in all true bifurcation lesions (Medina 111 , 011, 101, ) It may not be required in 1,0,0 if carina is away from lesion. 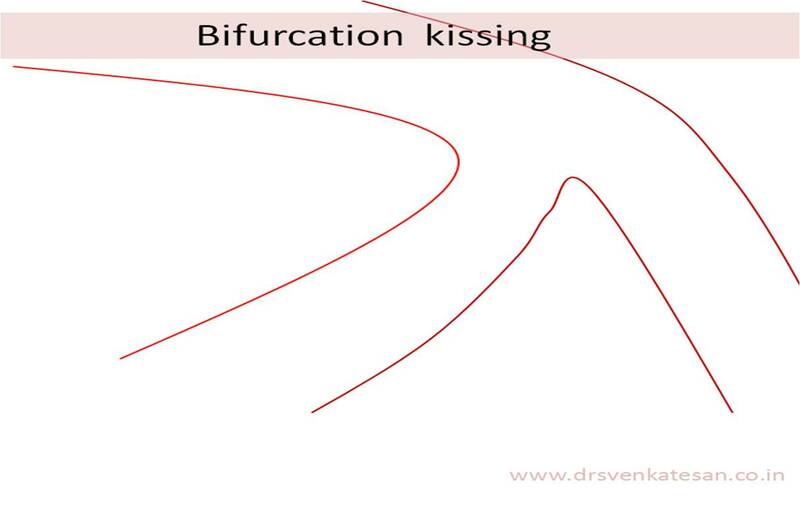 *Kissing can rarely aggravate the same issue which is supposed to prevent ie plaque shift .This is due to differential pressure transmission by two balloons. Is there a role for twin balloon POBA without any stenting ? A distal RCA with a PDA ostial branch lesion could be tackled with twin balloon POBA. Which balloon is to be used? It depends on whether we use the technique as POBA, single stent or double stent technique. Non compliant balloons are ideal as it exerts more pressure on the vessel wall . Kissing at what pressure ? The pressure used is often between 8-14 ATM. Experts may use differential pressure inflation depending on the lesion characters. Which is the Most complex form of kissing ? Two stents, two balloons . Here the interface contains two metal layers . At carnia the two metals engulf two layers of tissue as well . Bifurcation lesions are being conquered with more success in recent years. The techniques have refined. Stent designs and drug eluting stents are helping us in many ways. We have learnt from our mistakes and accepted the limitations. Wisdom prevails now , there is a universal consensus for less metal in the notorious carinal area. Still, ignorance remains* as a major guiding force . . . when we navigate the difficult atheromatous terrains in live human coronary arteries ! *With due respects to IVUS, OCT and FFR . **Forward looking IVUS, and camera tipped guidewires may change the scenerio.